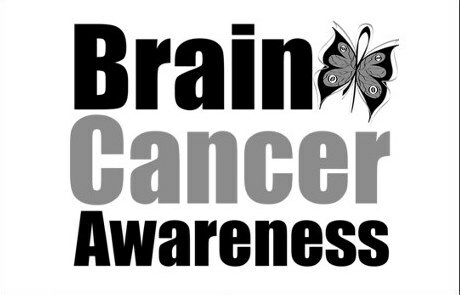 Brain tumors are the most deadly of pediatric cancers. More than 3,000 kids are diagnosed each year, and just a few of those are babies. There have been huge advancements in the past few decades, but the prognosis is still grim for children with brain cancer. We need research to find a better treatment and cure for kids like Scarlett. 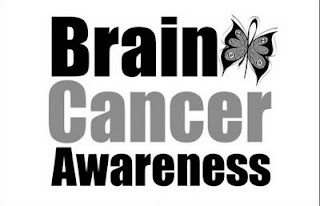 The National Brain Tumor Society has ways for you to help. We get a lot of questions about Scarlett. I am happy to share and answer questions, since I know most people don't have any experience with kids with cancer. I want to promote as much understanding and support of Scarlett and her fellow cancer fighters as I can. How did you know she had a tumor? We had no idea. There were no outward signs that anything was wrong. Most kids present with symptoms like vomiting, dizziness, seizures, or lethargy. She had none of these, just a bruise above her left eye. Our family doctor got an emergency CT scan at her 2 month Well Check based on her fontanel (soft spot on her head) bulging and being tight and her increased head circumference. We didn't know it was abnormal - that is something never covered in the baby books. You can barely see the bruise above her left eye. This was taken a few days before the tumor was discovered. Scarlett's tumor was congenital, which means she was born with it. It developed along with her brain in utero. Unlike many cancers, there is no known cause nor risk factors; somewhere in her development, a cell mutated, and from there the tumor grew, absorbing blood and nutrients from her growing brain. Where does she get her treatment? Her major surgeries were done at Children's Hospital Oakland in Oakland, CA. She was diagnosed and now has chemotherapy at Lucile Packard Children's Hospital at Stanford in Palo Alto, CA. She is a part of a research study (SJYC07) in conjunction with St. Jude Children's Research Hospital, but all elements of the study are done at LPCH. Both near our home in the San Francisco Bay Area. Why does she have to do chemo if the tumor was fully removed? There is no way to guarantee that every cancer cell was removed. This type of tumor is very aggressive and can grow back quickly from even once cell. Chemotherapy aims to kill the cancer cells so they can never grow back. Will her brain grow or expand and fill her skull again? The pink line outlines the tumor in December. After surgery, that area is all fluid. 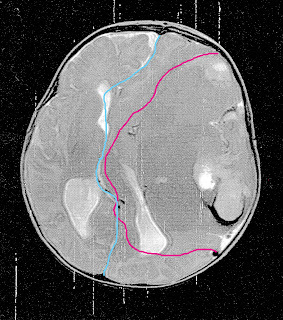 The blue line is the midline of the brain, which was once pushed to the right but is now centered. No. Her tumor was very large, even among other brain tumors. It did irreparable damage to the brain structures. Most of her left hemisphere never developed. Once the tumor was removed, her brain did move slightly; this is likely the cause of the seizures she experienced early on. I think of it like her brain could finally exhale after holding it all in to make room as the tumor grew. How long is her treatment? Her particular protocol has 12 cycles, each one month in duration, that includes various chemotherapies, imaging, tests and recovery. We have already experienced some delays due to infections, low blood counts, and surgeries, so we hope for her to be off therapy by summer 2012. If there is any regrowth, we will have to reevaluate her treatment and see what comes next; though we hope to avoid it, radiation may be necessary in the future. What kind of long term effects does the tumor and chemotherapy have on her development? We don't know. Every brain heals differently from such a large injury. Baby brains are amazingly adaptable. As of now, there are no real signs of neurological challenges. We know that she may have some limited peripheral vision on the right, but we won't be sure until she is older and can tell us what she sees. We are learning she has some hearing loss due to one of the chemo drugs; further testing will give us a better idea, and then her doctors may alter her therapy plan. Despite missing most of the left hemisphere, she moves both her left and right sides equally. She gets physical therapy and occupational therapy to help make up for all the time she spends in hospital beds and to help her learn to manage her heavy, unbalanced head. Otherwise, we will just see what happens as she gets older and adjust as we go. Chemotherapy can have cognitive effects on developing brains. It can also lead to increased risk of subsequent cancers years after the initial therapy is complete. Why does she need a shunt (especially if they get infected?!?)? The tumor damage caused a secondary condition called Hydrocephalus, which essentially means too much fluid in the brain. Brains are suspended in, cushioned by and filled with cerebral spinal fluid (CSF). Most brains produce and drain CSF constantly on their own. 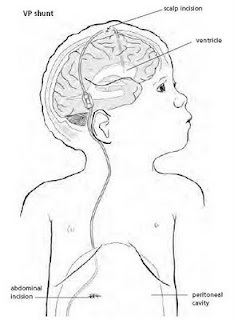 People with Hydrocephalus have problems with drainage, so the fluid builds up and causes pressure in the brain. In babies, this expands the cranium and causes the head to be enlarged. In older kids or adults, it causes headaches, seizures, etc. because the bones of the cranium are fused and cannot accommodate the increased pressure. 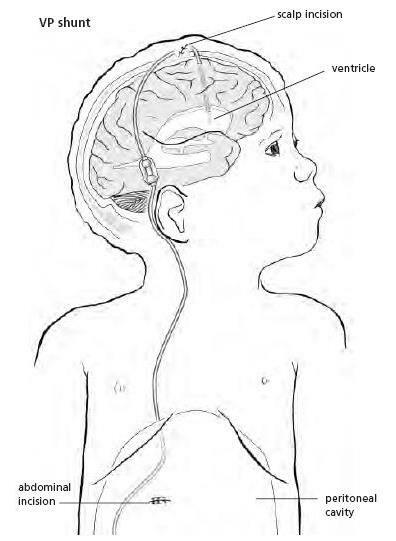 Shunts are placed in the brain to help drain CSF to maintain appropriate inter-cranial pressure. A shunt is an artificial drain to move CSF out of the brain to the abdomen where it can be reabsorbed. She will always need a shunt. It should not limit her activity as she gets older. Unfortunately, shunts are prone to infection and malfunction. When they get infected, heavy doses of antibiotics are used to clear the CSF, and then a new shunt many be necessary (she is on shunt #2 already). It is an imperfect solution to the problem, but it is the best we have now. When will she be in remission/cured? I am not sure, really. She will be a part of the study for many years. She will get MRIs every two months right now, then we will begin to spread them out to once a year after she finishes chemo. I think she will visit the neurosurgeon (for the shunt) and neuro-oncolgist (for the tumor) at least once a year as long as she can. I don't know if I will ever be able to stop worrying that the cancer will return. Thank you again for so clearly explaining Scarlett's condition to us. If only all of the doctors were able to explain it so easily to you. It literally sounds like a different language at times when doctors are explaining medical conditions. Since it is brain tumor awareness month, will you have any fundraiser type of sales with items we can purchase in support of Scarlett? That would be fabulous. Please post the information if you do. Thank you. Continuing prayers, hugs and love from So Cal. You really are an amazing family. It is so touching that you have the time and room in your heart to care about all of us strangers out here reading your story. Perhaps it's like therapy for you to be able to blog and share your knowledge, perhaps you do it to kill of boredom. It doesn't matter why. It's so amazing to read about all of this. It is the most scary and horrible thing I can imagine a mother can go through. You are such an inspiration to me. On my bad days I remind myself, Brandi can handle her daughter having brain cancer, I am definitely capable of handling an almost 2 yr old throwing fits and food all over. I continue to say prayers for you and your family and all of the other families touched by cancer in there dear little ones. My hopes for you are that Scarlett grows up never remembering any of this and that you and your husband will one day be able to have moments where you forget to worry about the cancer completley. Thank You brandi for the wonderful info, I also am one that has been following Scarlett's Bravery and your guys also since day 1 of the blog (thank you for sharing a amazing story with all of us), This helped alot of the ?s i kept asking myself, again ty for sharing your daughter with us we all love her like she was our own!! Keep fighting scarlett!!! Brandi-you are truly grace under pressure. Thank you for update and information. You are so awesome and did great with these questions! Thank you!! Children's Hospital Oakland rocks! My brother was there as a baby.